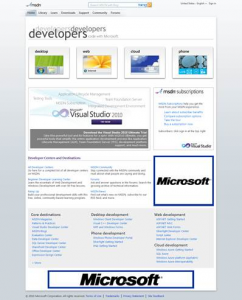 In two 2009, I presented a deck to Emma Williams (the head of the EPX organization – responsible for MSDN sites and library) to describe how Microsoft had an opportunity to better connect to its developer community. In that conversation, I talked about how development was becoming less of an ends unto itself. Coding is quickly becoming something that people learn in high school or college as part of a pallet of skills they need as part of the modern work force. With some concrete data about the distribution of pro developers to non pro developers and the iPhone app phenomenon, I presented a really solid case. Emma loved the presentation and asked me to talk to Nathalie Irvine, the GM of the STO group. Before I knew it, I had the job of driving change in the way that Microsoft corporation connected with all types of developers through the MSDN websites. It was the beginning of an exciting adventure and a mission to drive positive business results. The demographics, interests and needs of developers have fundamentally changed since we first launched MSDN in 1992. At that time Dr. GUI was ushering in a new area of visual computing for people for whom computing was the central part of their lives. The role of developer now extends to anyone employing code as part of their daily lives at work or at play. To speak to this broader audience, we need to focus on their scenarios, use language they understand, develop meaningful taxonomies, customize educational approaches, incorporate more samples everywhere and generally build a great experience from search to solution. The MSDN Home and Hub update is the first step on a roadmap to providing greater value to our customers in a way that is meaningful from their world view and relative to their goals rather than our product centric view. 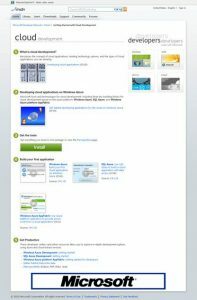 MSDN today offers a large number of developer centers focused around Microsoft products and technologies (e.g. VS, VB, Windows, Office… ). From MSDN site surveys, DTS studies, focus groups, usability research, direct customer feedback, blogs and other data sources we hear a number of specific requests from developers; make on ramping easier, improve better search, more sample code everywhere, detailed simple prescriptive guidance, better “how to” directions and more objective, directive feedback about how to effectively leverage our tools/platforms for real life end to end scenarios. Developers, how they learn, how they code and the economy have substantively changed over the past few years. According to IDC, there are 8.6 million professional developers, about 39 million academic developers and about 104 non-professional developers. Some portion of these developers are a significant new customer streams for Microsoft platforms, but they are increasingly pragmatic about their choice of tools and platforms to target, and they want to be productive fast in order to make money. In addition to having a compelling value proposition for the platform, they need a friction free on-boarding experience, a strong supportive community and a great and easy way for them to get proficient through real life “How To” guidance. For the MSDN Home and Hub Beta 1 release we continue our passion and focus around building meaningful End to End experiences by reflecting on our key design goals. The four new Hub pages follow the basic template designed to express the simplicity of acquisition. Industry Perspective – Explain the platform from an objectively and industry perspective. Microsoft’s Perspective – Describe Microsoft’s offering in this space. One Click Install – Make it very simple (one click where possible) for me to get the tools. Reduce developer friction. Code Quickly – Show me the programming options with video and code so that I can start coding quickly. Show developers that they can do this. Make Me Productive – Show me the development centers for each technology so that I can continue learning. Here is a snapshot of customer feedback based on focus groups and early preview of the new pages.